The Cultural Alliance of Fairfield County is a nonprofit service organization that supports its members through unified marketing, capacity building, professional development, and advocacy services. This newsletter is sent to all who request it - but we ask that, if you are not a member, you explore membership benefits and consider joining this community of more than 575 individuals and organizations. You can sign up here. Our 2018 ACE Breakfast Awards recognized and celebrated the individuals, organizations and businesses that have made significant artistic and cultural contributions to our community, as well as those who have supported the arts and culture sector through volunteerism and/or patronage. It was a fantastic program! Robin Tauck, co-founder of the TRIP Foundation, captivated the audience with her keynote address and made an incredibly generous challenge to help us complete the funding of our new website (see below). 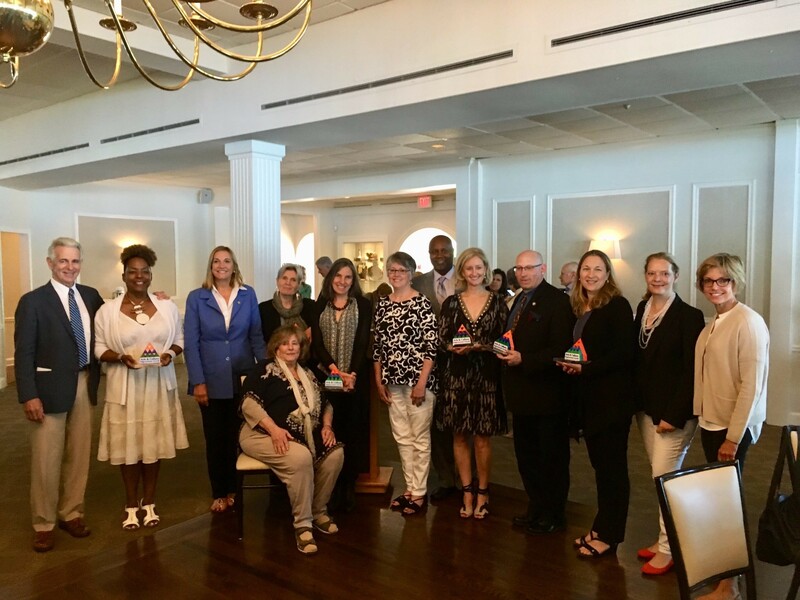 This year’s recipients represented the depth of talent in Fairfield County, the interconnections among them, and the tremendous commitment by those who strive to make our area an attractive place to live, work and play. Our thanks to Megan Bonneau McCool, Dennis Bradbury, Valerie Cooper, Jim Royle, and the New England Dance Theater for all you’ve done – and what you continue to do to enhance the cultural life of our region. We also honored the life and legacy of Burt Chernow by presenting a special President’s Award to his family, in recognition of the impact he made on the arts in Fairfield County. Photo of award winners, courtesy of Adair Heitmann. From left: James Naughton, Valerie Cooper, Robin Tauck, Dennis Bradbury, Perrin Stein, Robbin Zella, Ted Thomas, Melissa Engel, Jim Royle, Megan Bonneau McCool, Amedee Maggard, and Meg Joyce. Sitting, Ann Chernow. Click for larger image. PLEASE HELP US MEET OUR GOAL! We were delighted to have received, in May, a $5,000 grant from the TRIP Foundation towards the cost of re-designing and re-building our Cultural Alliance website, which will integrate our two faces: the Cultural Alliance of Fairfield County and FCBuzz.org. At the ACE Awards Breakfast, we were thrilled when TRIP Foundation president (and ACE Awards keynote speaker) Robin Tauck, understanding the critical role of a strong digital presence for the Cultural Alliance, challenged the audience that if we continued our campaign to complete the website redesign project, she would match all donations up to a further $2,500! This match will enable us to complete and launch the website by late July. Please help us meet our goal by making a donation of $10, or more, at this Impact Vine donation site. Thank you for your support! UPDATE: With 38 days to go, we are 24% of the way ($608) to meeting our $2,500 goal. MAKE MUSIC DAY CT is coming on the Summer Solstice, June 21, and there are four Make Music Days in Fairfield County. Hear a podcast of our June 11 WPKN 89.5FM Spotlight on Arts & Culture interview show, where you will meet the producers of the events in Stratford, Bridgeport, Fairfield and Stamford, as they talk about their line-up for the day, what the contribution of their town will be, and what impact this will have on their town's music scene. PLUS a live performance by members of The Hot Club of Black Rock! Meet Alex Toombs from Fairfield's FTC, Annette Einhorn from Stamford Downtown, Suzanne Kachmar from the Bridgeport Art Trail and Colin Healy of the Stratford Placemakers. This is our regular Spotlight on Arts & Culture interview show, the 2nd Monday of each month, at noon on WPKN.org 89.5FM. Catch podcasts of recent shows on ACE Awardwinners, Creating a Sustainable Future, Who Cares About Public Art, Creative Placemaking and Adger Cowans. 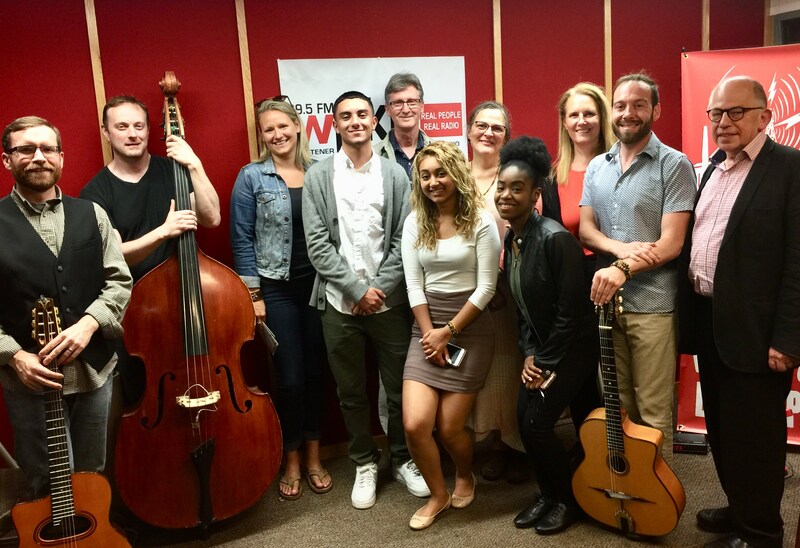 Those involved in our June 11 Spotlight on Arts & Culture: From left to right: Matt Dempsey, guitar, Frank Brocklehurst, upright bass, Alex Toombs, FTC, Libio Carro, Stamford Downtown intern, Colin Healy, Stratford Placemakers, Aileen Agudelo, Stamford Downtown intern, Suzanne Kachmar, City Lights Gallery & Bridgeport Art Trail, Derve Jean, Stamford Downtown intern, Annette Einhorn, Stamford Downtown, William Earley, guitar, and David Green Cultural Alliance of Fairfield County. Behind the scenes (and camera) Steve di Costanzo, General Manager of WPKN. Click for full image. More than 100 people have already had a rocking time attending SAVORCITY visits to Ruuthai's Kitchen and Bereket's Turkish Cuisine. Next on this monthly tour of the restaurants of the many diverse neighborhoods of Bridgeport is Trattoria 'A Vucchella in Downtown Bridgeport, with a prix fixe authentic Neapolitan menu for $30 (veggie option, wine pairings; wine and dessert extra). The artist Liz Squillace will be showing her latest work, while jazz singer Uma Lou, will be accompanied by Matthew Detroy, piano, and Rich Zurkowski, bass, in two sets. This event is generously sponsored by HSW Apartment Building, 1115 Main Street, and Hatch 130, the full-service design agency based in Bridgeport. Reserve your seat here! Painter Ganga Duleep was born in India, and, after traveling the world, now lives in Norwalk and New York City. She paints mostly in acrylic on metal, commenting that she prefers to paint "on metal - aluminum, stainless steel, or copper - because light refracts off the metal in delightful, astonishing ways, depending on the angle from which the painting is viewed and the intensity of the light shining on it. Hence the painting always commands attention, since it is never static and cannot fade into the background." Her subjects are landscapes and cityscapes. Of her method, she has said: "Initially, I play with the juxtaposition of shapes and colors arranged with basic design principles. Eventually the colors or the shapes evoke a memory of a scene or person that had an association with a strong emotion. I try to paint that emotion. From that moment on, the painting takes on a life of its own, with the end result providing me with fresh insight as to the person I have evolved to be." As one who has traveled the world extensively, she is delighted when others feel the emotion she has been working to convey. "I have been able to communicate globally with this universal, wordless visual language of common humanity across the barriers of diverse cultures and languages." Ganga has shown her work around the world and currently has My Apple 7 in the Salute to the Stars show at the Amsterdam Whitney Gallery (531 W 25th St) and also in the New Britain Museum's Nor'Easter show. See her website. Jonathan Wilner, born in New York, began his studies in Drawing at the Art Students League. It was there that he took an interest in, and began his study of Japanese Brush Painting with a private teacher. Inspired then by the U.S. Landscape Movement of the 19th Century, and looking to the Tonalists and Impressionists for inspiration, he turned to the study of artists of the Hudson River School, Scalp Level, New Hope, Old Lyme and California Impressionists for further inspiration. In his own words, “I began chasing the ghost on the canvas, and the images simply emerged then from my own unconscious mind, and as I had often painted landscapes from imagination, I have come to the conclusion that it is far more effective to simply ‘liberally interpret nature! '” In the studio, Wilner explores other subject matter and paints from memory that which he internalizes from his visits abroad. Most recently, Jonathan has moved his studio to 305 Knowlton Street in Bridgeport, and his painting has increasingly reflected the branch of Surrealism known as Liminalism. In Liminalism, though dreamlike, the images emerge within a twilight ambiance. Some are blurred while others clearly emerge. "Liminalism reminds the viewer of the burden of time as the subject portrayed emerges from darkness but also fades back into it." The work on his website reflects an earlier period of development in Liminalism. Jonathan is having a solo show next spring at the Da Silva Gallery, New Haven. Nina Bentley, Nancy McTague-Stock, and Dale Najarian are three of the 10 women artists featured in Her Window to the World: East & West Coast Artists, organized by Elisa Contemporary Art, Peter Roland Home, and The Vanderblue Team, as a Greenfield Hill, Fairfield Pop Up exhibition at 2263 Hillside Road, Fairfield. Opening Reception, Fri. June 15, 5:30pm to 8pm. Through July 30th. Eric Chiang, Ganga Duleep, Katherine Evans, Nancy Moore, Cynthia Mullins, and Steve Parton, are 6 of the 70 artists participating in Nor'Easter: The 48th Annual Juried Exhibition organized by the New Britain Museum of American Art to expose contemporary visual arts to a wide audience. The juror is Stephanie Haboush Plunkett, the Deputy Director and Chief Curator of the Norman Rockwell Museum. This prominent showcase in the Northeast region highlights the exceptional work of emerging artists in all media. It opens with a reception Sun. June 24, 1-2:30pm. 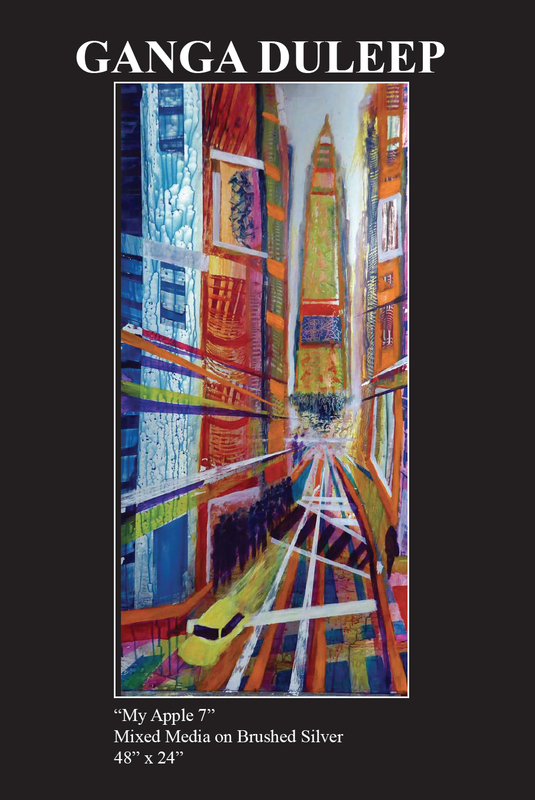 Elizabeth Hasegawa Agresta has a one-night-only solo show of cityscapes and landscapes. 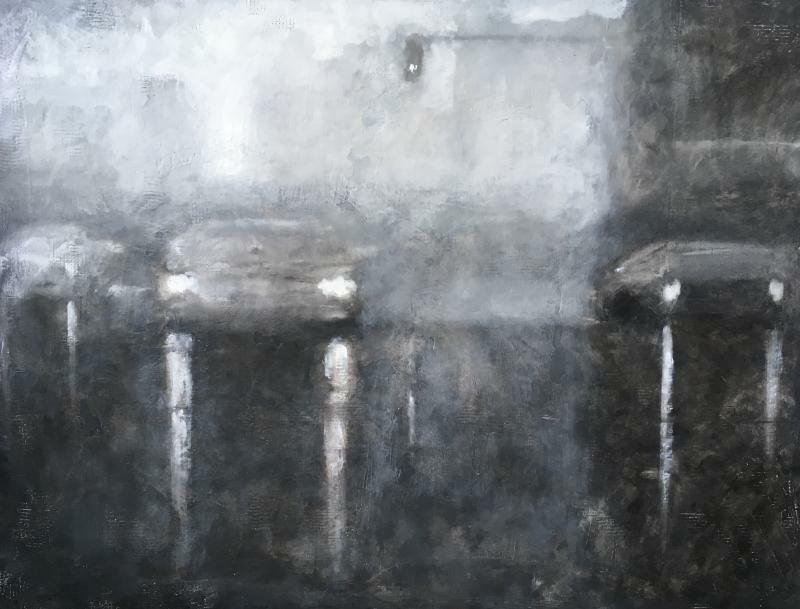 including Aftermath (2017, oil on canvas 30x40, detail at right, click for complete image) at the Ridgefield Playhouse, Sat. June 16, 6:30-8pm, before the jazz performance by Al Di Meola. She also has her piece Connections (2017, acrylic and charcoal on canvas) included in Art & Soul a group show, organized by The New York Society of Women Artists at Prince Street Gallery in New York City (530 W. 25 St, #402), opening with a reception Sat. June 23, 5-8pm. Alicia Cobb and Joy Monroe (together, two of Connecticut's predominant body artists) are co-producing Unframed, a fine body art production, celebrating the human body through movement, music, song and color, Sat. June 24. Both Alicia and Joy have competed and placed in national and international body paint competitions such as the North American Body Paint Championships. This experience highlights their skill and they have assembled some of Connecticut's most talented singers, dancers and even body builders for an unforgettable evening at The Boathouse, 305 Knowlton Street, Bridgeport. To find out more and buy tickets click here. Adger Cowans, a long-time member of AfriCOBRA (African Commune of Bad Relevant Artists), founded in Chicago, in 1968, as one aspect of the Black Power Movement, has photographs included in a 50-Year Anniversary show, AfriCOBRA Now, of what is possibly the longest-running artist collective in the U.S., at Kravets Wehby Gallery, 521 West 21st Street, New York. The show opens with a reception Sat. June 16, 6-8pm, and runs through Aug. 17. The group was founded to help to change the world, and the show aims to show the breadth and diversity of a movement that has had a constantly evolving and adapting vocabulary. Find Adger in the shot to the right, taken by him (click for larger image). Other artists include Akili Ron Anderson, Kevin Cole, Murry DePillars, Jeff Donaldson, Michael D. Harris, Napoleon Jones-Henderson, Barbara Jones-Hogu, Jae Jarrell, Wadsworth Jarrell, James Phillips, Gerald Williams, Nelson Stevens, Frank Smith, and Renee Stout. 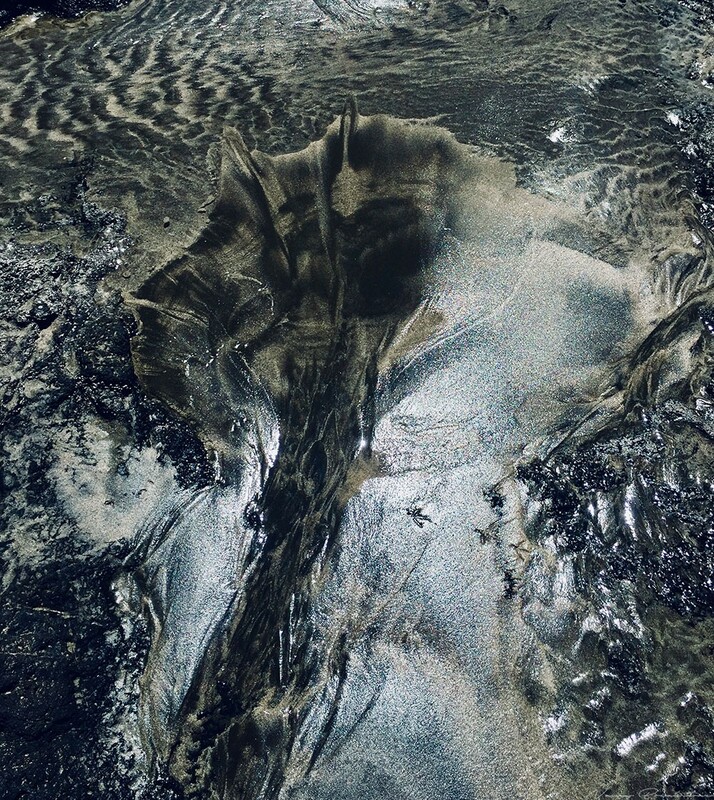 Nancy Breakstone, is showing her photograph Early Morning in Death Valley (digital photograph, 28x31, detail at right) at the Stamford Arts Association New Members Show, that opens with a reception Fri. June 22, 5-8pm and runs through July 12. She says that she took the shot at just the most perfect moment possible: at dawn just after an all-night sandstorm had stopped allowing Nature to sculpt the dunes as perfectly as they will ever be. Congratulations to Joseph Dermody who won Best in Show at the Rowayton Arts Center's Focus Under 40 exhibition, that opened Sun. June 10, with his Vortex (2018, acrylic on canvas, 36x36, click image at right). Vortex, which is about capturing and harnessing the energy of movement and visually representing its layers through color and wavelength, is part of Joseph's Tesla Collection and was one of four pieces he has in the show, which runs through June 24. Carol Nipomnich Dixon has had her embroidered assemblage Eyeing Art (2016, mixed media, 15x15, at right, click for larger image) juried into the Art Society of Old Greenwich’s annual Open Juried Art Show, opening with a reception, Fri. June 15, 6-8pm, and running through July 13 at the Bendheim Gallery, Greenwich Arts Council. 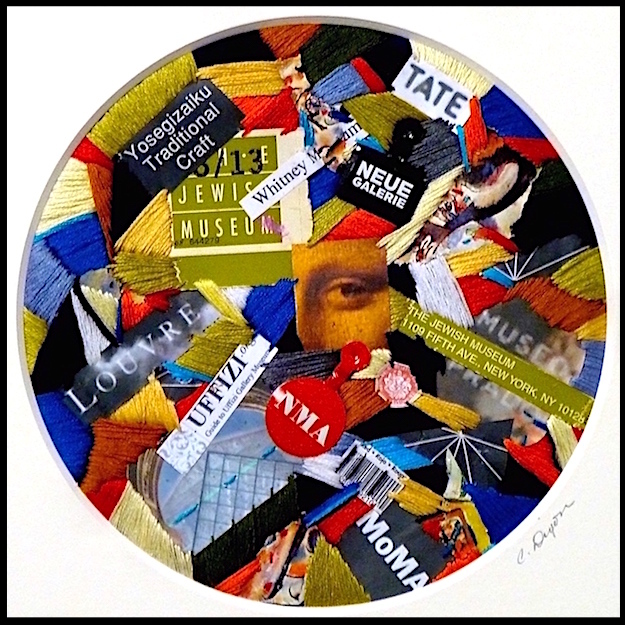 The selected 15” square framed work incorporates art museum and gallery logos from around the world along with photo fragments of a Kandinsky painting and the I.M.Pei Louvre pyramid. At the center is a close-up photo fragment of the Mona Lisa’s eye. All of the elements are connected by embroidery thread, using traditional satin and free-form stitches. Kat Evans has paintings in two museum shows. Her Color Awakenings X (acrylic on canvas, 36x36) was juried into Three: A National Juried Exhibition at the Attleboro Art Museum, Attleboro, MA. The juror is writer and journalist Alexander Castro. The show opened June 14 and runs through July 31. Kat also has had Conflict Resolution (2012, acrylic on canvas, 60 x 60; at right, click for larger image) juried into the NBMAA's Nor'Easter exhibition, opening with a reception Sun. June 24, 1-2:30pm. 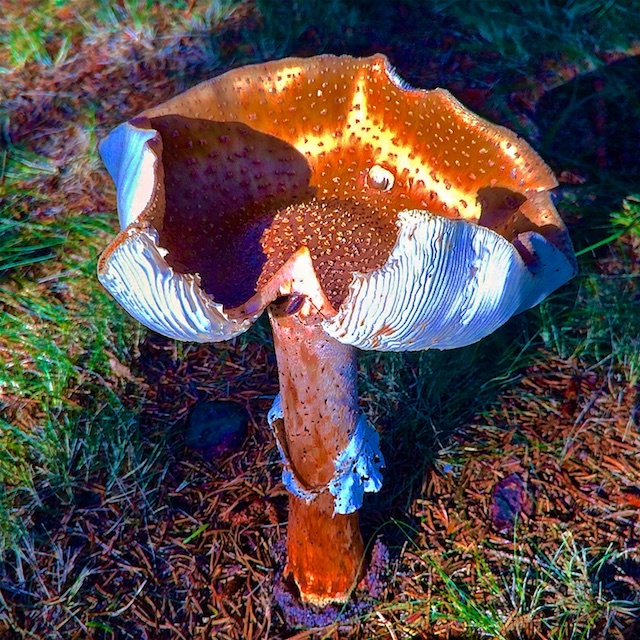 Mary Harold has a solo show of her photographs at The Way of the Sword, 21 Governor Street, Ridgefield, through mid-July. The exhibition showcases many of Mary's photographs in her abstract metal series. At right, Railway Cars (2017, color photograph, 18x24). Photographed in 2017 at a Railroad Museum. 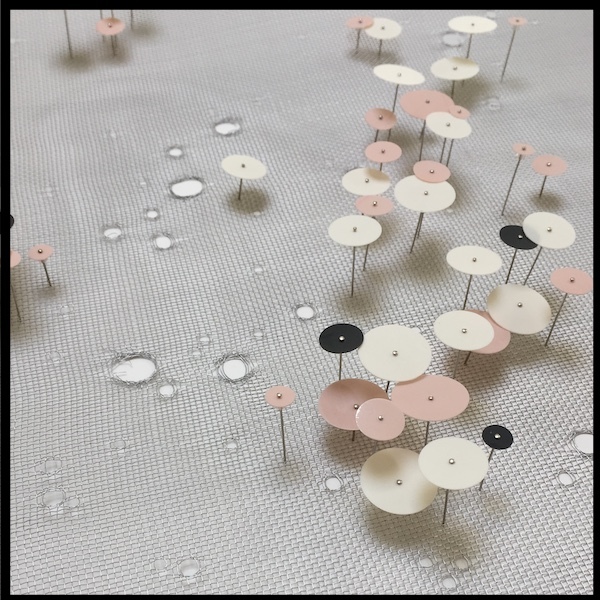 Nadia Martinez has her site-specific installation Exploring New Territories (2018, metal mesh and sequins), and related artwork, at the Stamford Art Association, running June 15-July 12, with an opening reception Fri. June 22, 5-8pm. Nadia's work here is all about pushing boundaries, daring to try new things, and seeing things from different perspectives, while approaching new experiences with familiar ways. 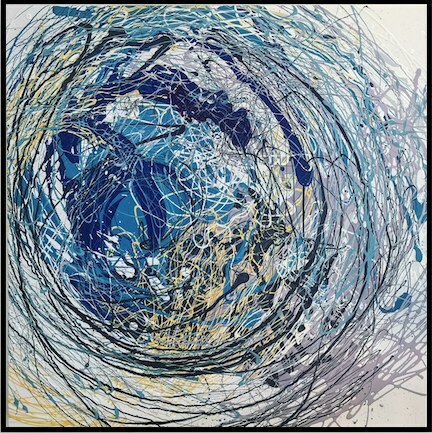 Nancy McTague-Stock is one of the ten women artists featured in Her Window to the World: East & West Coast Artists, a pop-up exhibition organized by Elisa Contemporary Art, opening at 2263 Hillside Rd., Fairfield, with a reception Fri. June 15, 6-8pm. The show highlights landscapes, waterscapes and cityscapes inspired by the surrounding areas of the featured artists. 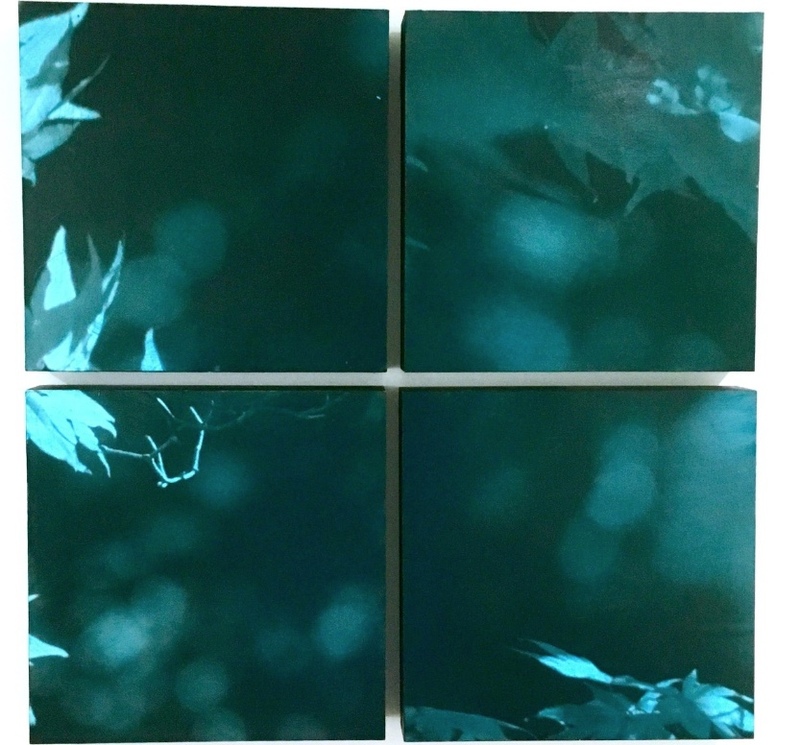 Nancy's work includes, Nocturnal Rhythms, (2017 photography, water based glazes, oil based glazes on wood panel 24×24×1.5," at right, click for larger image). Congratulations to Nancy Moore for receiving the Juror's Choice Award in the New Britain Museum of American Art's Nor'Easter exhibition for her Wonder Girl (2018, watercolor, 32x39, detail at right, click for complete image). The exhibition opens with a reception Sun. June 24, 1-2:30pm, with awards presented at 1:30pm. Nancy will give an artist's talk, Thurs. June 28, 5pm, during the "ArtHappyHour." Steve Parton had his Chicken Feed (2017, oil on canvas 24x20, detail at right, click for complete image) accepted into the New Britain Museum of American Art's Nor'Easter exhibition that opens with a reception Sun. June 24, 1-2:30pm, with awards presented at 1:30pm. Steve comments that he has a collection of lead figures from childhood that he had to play with one last time - and this led to a series of paintings, juxtaposing living creatures with inanimate toys. Steve uses a traditional, Renaissance oil painting technique: monochromatic earth tones are followed by clear glazes of color applied after all the modeling is finished. Marjorie Poe, who was the guest presenter on June 13 at the Fairfield County Arts Association, has several pieces in Brush With Nature, the annual spring show of the Oriental Brush Artists Guild, at The Hammond Museum & Japanese Stroll Garden, 28 Deveau Road, North Salem, NY, through Sat. June 16. 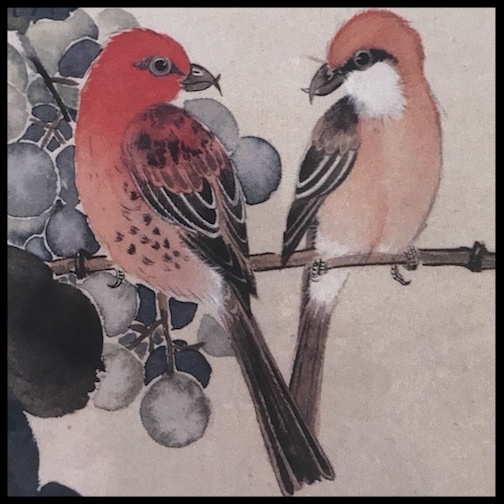 At right, detail of Marjorie's Four Seasons - Summer (Chinese ink and pigment watercolor on rice paper), which was used as the exhibition's postcard. Mariya Rivera had two of her paintings, Unwinding and Willing, juried into the Art Society of Old Greenwich’s Annual Open Juried Art Show, opening with a reception, Fri. June 15, 6-8pm, and running through July 13 at the Bendheim Gallery, Greenwich Arts Council. Unwinding (2011, oil on linen, 30x20, detail at right) won 3rd prize for oils. 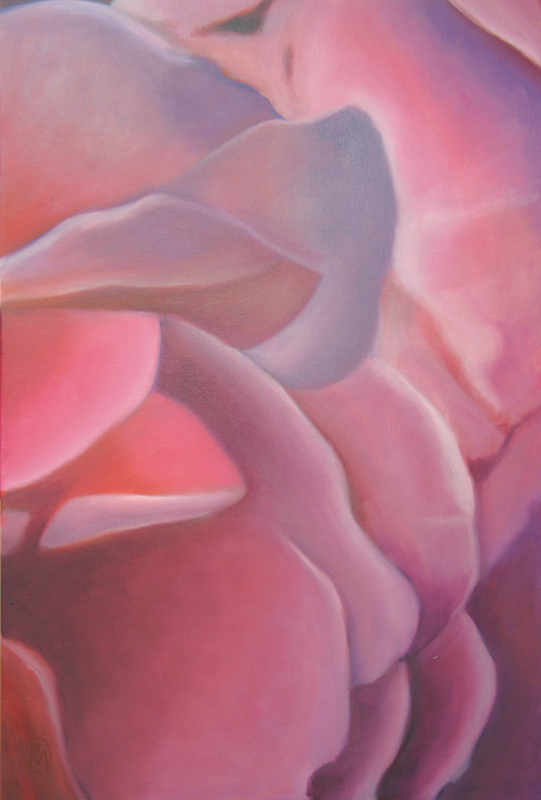 Mariya comments that both works were Inspired by fragrant pink roses at the Atlanta Botanical Gardens: "These images investigate the shapes and color relationships presented when I viewed the flowers as a landscape unto themselves." The juror for the show was Isabella Garrucho, Isabella Garrucho Fine Art, Greenwich. Liz Squillace has a show of 10 of her latest paintings, opening at Trattoria 'A Vucchella at the SavorCity event at the restaurant Tues. June 19, 6-9pm (reservations required), through July 15. Closing reception TBD. At right her L.A. 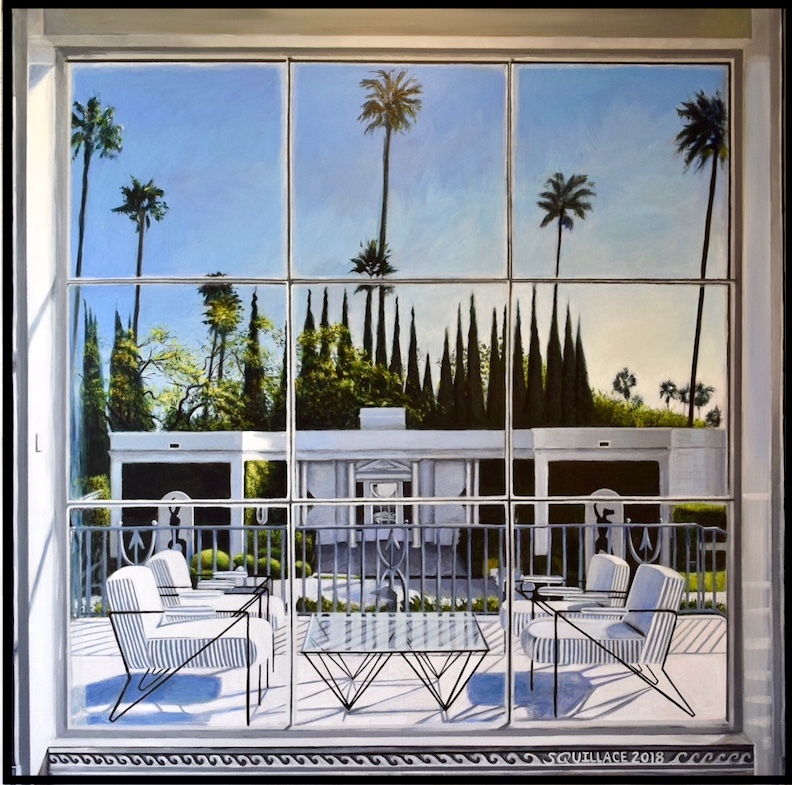 Window, (2018, acrylic on canvas, 72x72, click for larger image). Liz comments that the works in the show are the result of increased studio practice through painting: "I am attempting to see as honestly as I can, and to represent that. I also want to open up space through painting and see these new works as my most spacious. I hope the show provides an inspiring visual ambience to a great night of live music and cuisine." Joan Wheeler's Metamorphosis (2018, oil on canvas, 30x40, detail at right, click for complete image) is on display with three more of her paintings in Art That Makes the HeART Sing at City Lights Gallery in Bridgeport. This exhibition is held in conjunction with Bridgeport's Make Music Day. The exhibition is open through July 7. The painting is about the untimely passing of Joan's sister Anne and her belief in the metamorphosis of the soul after death. Elizabeth White has two mixed media sculptures selected by Carmen Hermo, assistant curator for Elizabeth Sackler Center for Feminist Art, at the Brooklyn Museum, for the Wide Open9 exhibition at the Brooklyn Waterfront Artists Coalition, on view through June 17th. 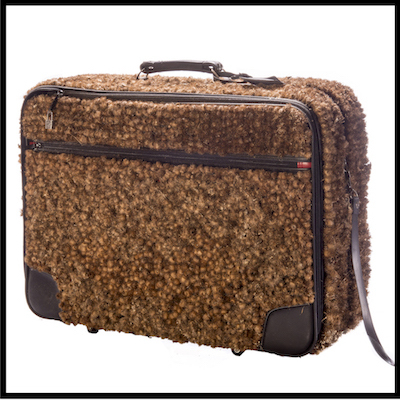 At right, Baggage (mixed media with burrs) and also Procession to Dust (mixed media with bones). The exhibition runs through Sun. Jun 17. Jarvis Wilcox is in a two-person show, a Summer Solstice Exhibition, with Robyn Fairclough, opening at the Southport Galleries with a reception June 21, 5-8pm. In his series of paintings on the meeting points of clouds and water on the horizon between coastal Connecticut and Caribbean waters, he engages the observer with the visual complexity of shifting sunlight, cresting waves, and evanescent atmospheric effects. At right, Clouds. Sat. June 16: Elizabeth Hasegawa Agresta, solo show, Ridgefield Playhouse, 6:30-8pm. Tues. June 19: Liz Squillace, Solo Show, Recent Paintings. SavorCity at Trattoria 'A Vucchella 6-9pm. Thurs. June 21: Jarvis Wilcox (in 2-person show), Summer Solstice Exhibition, Southport Galleries. Opening Reception, 5-8pm. Sun. June 24: New Britain Museum of American Art, Nor'Easter. Opening Reception, 1-2:30pm (Eric Chiang, Ganga Duleep, Katherine Evans, Nancy Moore, Cynthia Mullins, and Steve Parton). Sat. June 24: Alicia Cobb, Unframed. Performance at 35 Knowlton Street, 7:30-10:30pm. NEA Media Arts Director Jax Deluca (third from left in image above) writes in The NEA's Art Matters blog about her take-aways from attending the Americas Cultural Summit, that looked to ways to advance public support for arts and culture as part of building vibrant, prosperous and inclusive societies. Jax curated Cultural Connectors: Creating Commons for Digital Inclusion, a panel featuring four international artists looking at creating equity within emerging art and technological forms. Each maintained an artistic practice closely connected with community-based education: M. Laura Ruggiero’s Storyhackers lab empowers underrepresented voices by splicing new narratives into the mainstream; Amor Muñoz teaches Yucatan communities how to build and incorporate solar-powered textiles into garments; Michèle Stephenson's new virtual reality space allows unacknowledged histories of racial inequities to be presented; and Taeyoon Choi’s art practice widens accessibility to the world of creative coding through the School for Poetic Computation. Digital inclusion solutions come in many varied forms and the panel showed evidence that the most practical and usable solutions come from everyday people working in their respective communities. The panel also served as a reminder for cultural leaders to consider more holistic approaches to digital inclusivity and further investment in their local artists as a resource to mediate the space between technology and marginalized communities. Jax was reminded that there is space for old and new; high tech and low tech: sometimes the simplest interventions are most effective. The rapidly accelerating prevalence of digital technologies enables new ways of creating, producing, and distributing artworks - it’s an entirely new ecosystem to learn and understand. But technology is a tool, so Jax says it's the responsibility of cultural leaders, and the NEA, to know the tech challenges facing the arts and cultural field at large. This includes taking the time to unpack the many layers of digital inequities existing within each of our communities. She says it is a common misconception that artists producing artworks in immersive media and creative code are well-funded - but that funding is mostly by way of technical support from technology industry partners and a limited number of funding opportunities are open to supporting such work. Hopefully, the NEA can work to better understand this new ecosystem, by forming new relationships, providing research and educating others about how to support initiatives at this intersection, the more we can help move the dial on this. NEA Media Arts looks forward to acting as a key resource on these topics and to help ensure that the cultural fabric of the future has everyone in it! For the entire article, click here. Art Fair presents a curated selection of up to 50 art galleries in the Greenwich and Westchester area. As many as 50 artists will be selected to display their original works at this four-day cultural event attended by leading primary dealers, collectors, interior designers, and corporate art curators. 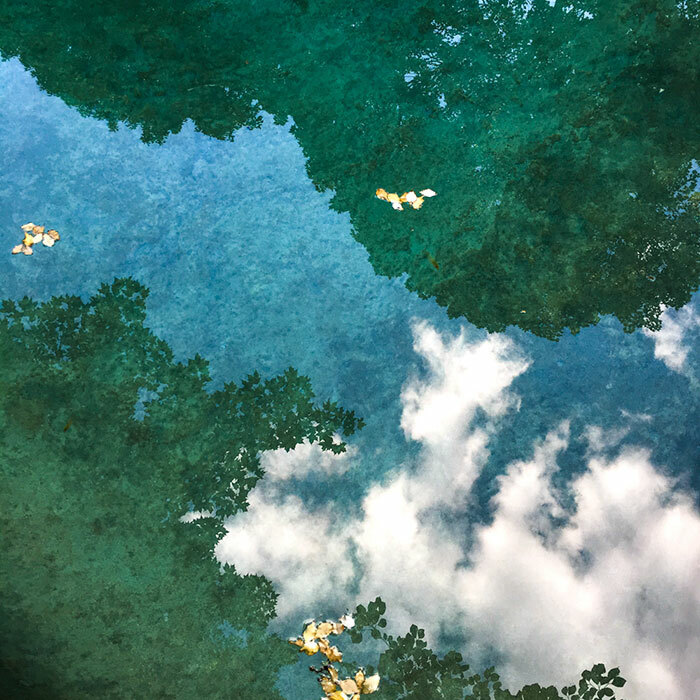 The venue for the ArtFair is the Performance Art Center of Purchase College, located in the center of Westchester County - 5 miles from Greenwich, and 30 miles from New York City. Artists selected by the panel of renowned jurists will have their work displayed for sale at the ArtFair. In addition, they will receive a complimentary invite to the VIP event commemorating their works at the Performing Arts Center of Purchase College on the evening of October 13. The Competition is a unique opportunity for both new and established artists to raise the profile of their artwork on an international platform. With a seasoned panel of jurors and a motivated demographic of art aficiondos, the 2018 Greenwich-Westchester International ArtFair Competition is the one event this year that both established and emerging artists should not miss. Media: drawing, painting, photography, digital art and mixed media (sculptures and 3-D work must be accompanied by a pedestal). Fees: $75.00 (up to 3 images); $85.00 (4); $95.00 (5). Fee for 3 & 4 images includes a complimentary ticket to the ArtFair ($70.00 value), five images includes two tickets (value of $125.00). Venue parking of $15.00 not included. Jurors: Bruce Laurie and Karen Lamonica Click for Prospectus here. Deadline July 1.
or make payments online here. The Greenwich Art Society (GAS) announces its annual juried members show, Parallel Visions, to be held at the Flinn Gallery at the Greenwich Library, July 25 through August 15, 2018. The juror is Jenny Harris, Museum of Modern Art, New York. This juried show is for GAS members only. Standard membership costs $75 (and gives a 10% discount with A.I. Friedman) - see details here. All media are accepted, except giclee prints. Fiber and Ceramic art encouraged. Art previously shown in GAS juried exhibit is not eligible and work completed prior to 2016 not accepted. Awards: Total of $2,000 cash prizes will be presented at opening reception. Fee: 1 piece $35; 2 pieces (max.) $50. Cash and checks only: artists may renew or join at entry or on website via PayPal prior to art drop off and must present PayPal receipt at drop off. All entrants are required to sign up for a gallery attendant shift to sit in the Gallery during the show. Only accepted artists are required to gallery sit during open shifts. Entering your work constitutes agreement to this condition. Receiving: Sat. & Sun., July 21 & 22 from 2-4 pm at the Flinn Gallery (for a $500 donation to GAS, you may make a private arrangement for drop off and pick up of your work, pay NO entry fee, and waive your volunteer time). Contact information. Note: the gallery director knows ahead of receiving what will be coming in for the show in order to put together a cohesive show. Please submit early. Gallery space is limited. See more in Opportunity Calendar below, after JOBS. Poets & Writers - the most trusted resource for legitimate writing contests grants and awards available anywhere. 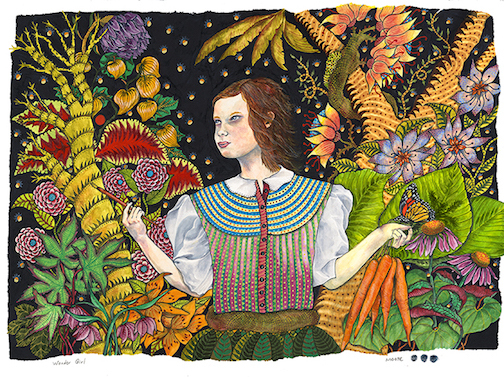 Zea Mays Printmaking, Florence, MA, offers a unique opportunity for a select group of artists seeking to deepen their artistic practice while developing their printmaking skills. The Artist Mentorship Program (AMP) pairs each participating artist with a Zea Mays Printmaking faculty mentor. Working closely together on a self-designed course, the mentor guides the artist through technical and conceptual challenges, helping refine the artist’s eye and skill. Regardless of age, experience and past art training, the AMP is open to all artists who wish to engage in a sustained studio experience designed to sharpen their abilities as artists and as printmakers. Mentorship can provide support, insight and clarity during the often challenging, artistic process. Mentors will respond to ongoing work, providing guidance, feedback and encouragement. Participants in the Artist Mentorship Program are assigned a faculty mentor with whom they work closely. They discuss how the program can provide a framework and direction for each individual artist. Mentors and mentees work closely to set goals. A mentor may provide hands-on demonstrations, printing assistance, critiques, editing help, assign readings or research, or recommend resources specific to the participant’s interest — helping the participant work toward and develop a focused project and deepening the experience of making, looking, and thinking about art. Mentors offer guidance in how to shape an interest into an idea, and an idea into a body of work.cPast mentees have come from California, Ohio, Maine, New York, Connecticut and Massachusetts. Long distance travelers often come for a week or two and combine their mentorship with a residency at Zea Mays. Details here. The 360 XOCHI QUETZAL Artist and Writer's Residency Program is located in Chapala, Jalisco, Mexico, on the shores of the largest lake in the country where the perfect year-round climate and stunning lake and mountain views have long established the region as an international artist mecca. Residents will be inspired by the natural beauty, history and culture of this special part of central Mexico. By providing free housing and five gourmet meals a week, we hope that our residents can make artistic progress without the stress and distractions of daily life. National and international visual artists, photographers, writers, playwrights, new media makers and musicians over the age of 23 are welcome to apply for the competitive residency. We base our selections on artists who demonstrate artistic accomplishment, submit a well-conceived residency project, indicate that this residency will make a significant impact and provide evidence of the self-reliance required for a residency in the developing world. 2018 FIBER RESIDENCY: This year's focus is on fiber related applications. For visual artists, this may include all fiber related media: fiberart, fiber installations, basketry, embroidery, quilting, textile design and printing, knitting, mixed media, paper-making, book arts, crochet, felting, beading, dyeing, rug hooking, wearables, jewelry, weaving and tapestry, fiber sculpture, and vessels. We welcome applications from writers working on fiber-related themes: articles, books, research, profiles, art criticism, etc. Musicians and composers whose focus is stringed instruments are also welcome to apply. Be creative with your application proposals! More information and application details here. The Artist Fellowship program, run by the CT Office of the Arts, encourages the continuing development of Connecticut artists. The program provides competitive Artistic Excellence grants of $5,000; Artist Fellowship grants of $3,000; and Emerging Recognition grants of $1,000. This is not a project grant; the funding provides an opportunity for artists to pursue new work and achieve specific creative and career goals. A recorded webinar focused on the FY2019 Arts Fellowship program is available for free: register here. Rennie McQuilkin, the Poet Laureate for the State of Connecticut since July 1, 2015, is stepping down from his position because of illness. The CT Office of the Arts has announced that it is now accepting nominations for the position of Connecticut Poet Laureate. As the state's representative poet, the Poet Laureate serves as an advocate for poetry and promotes the appreciation of and participation in poetry and literary arts activities among Connecticut citizens. A poet must be nominated by a Connecticut resident. A self-nomination will not be accepted and no award will be given posthumously. The nomination deadline is Friday, July 6. Nominators and interested poets are advised to read the guidelines for more information. N: How can artists find opportunities? Sébastien Sanz Santamaría: Seek out those in your inner creative circle with active practices and find out the opportunities they’ve had: grants, residencies, and extra training. Follow up by asking them for advice on specific programs or directions to take. Look through available online resources like NYFA, Rivet, cultural councils, newsletters, and directories to find opportunities. Search using social media hashtags like #opencall, #grants, or #residencies. N: What should artists keep in mind when applying for opportunities? SSS: They should ask four questions: What do I need to advance my creative practice? Does this opportunity (grant, residency, workshop, etc.) provide the resources and means for me to advance my practice? Do I have all the requirements necessary to apply? Have I reviewed all the details of the program entirely? Gabriela Galván: You must select the right opportunity at the right time - and then perseverance is very important. Often, one successful experience takes you to the next. Consistency will help you find success. Any application will be connected with your current artwork, so both the application and the work has to be strong and clear. N: What do you look for? GG: Opportunities can provide different kind of benefits, time, funds and economic support, space, a network of colleagues and professionals, knowledge, concentration, inspiration, professional development, intellectual development, challenges, and new experiences. For me, residencies have been the best opportunities. I find value in an environment supporting creativity, intellectual and professional growth, and diverse artistic points of view and culture. N: How do you access opportunities? Joanna Castro: Create community by attending events and have your elevator pitch and business card ready. Be deliberate about your online presence. What do you want people to know about you and your work? Apply for programs. Give yourself plenty of time to review all materials and get someone to be your second set of eyes. The Silvermine School of Art is seeking a full-time Administrative Registrar. The hours are Mon.-Fri. 9am-5pm, although the candidate must be available to work some weekends. The Registrar position is highly administrative, and strongly customer service oriented, which contributes towards the smooth operation of the School Office. We are looking for someone who is friendly, patient, can easily adapt to different customer situations and learn new systems. The Registrar position provides an excellent opportunity to learn about the operations of a well-established non-profit community art school. Qualifications: Bachelor's degree preferred; strong interpersonal and communication skills with the ability communicate professionally with individuals at all levels of the organization; proven capacity to apply independent judgment in planning, prioritizing, and organizing multiple tasks in a diversified workload; highly detail-oriented, organized and motivated with a positive attitude; must have computer knowledge, including, but not limited to MS Word, Excel, PowerPoint and Outlook; ability to work in a fast-paced environment; proven success in written communication, including proofreading and editing; team player, comfortable with collaborative work environment. Responsibilities: register students via phone, mail and in person; advise students on course options; notify students of course or workshop changes (postpone, reschedule, or cancel); contact faculty with enrollment numbers; confirm and cancel; work with faculty in all capacities; design and layout all email blasts through Cconstant Contact; maintain database in all capacities; update database each semester with new course and workshop schedule; prepare refund requests for school financial manager for canceled classes and workshops; update and edit website for school data, photos and event information; design flyers and posters for school; maintain mailing lists; and coordinate and schedule private lessons. Valued: non-profit employment experience; office administration experience; art background helpful. Silvermine School of Art provides year-round courses designed for full and part-time students of all ages and levels, from beginners to professional artists. In addition to the adult program, the school features courses for junior and youth, Summer Art Programs, and classes for young children and parents to experience art together. Send cover letter and resume to School@silvermineart.org. Applicants must include cover letter. No phone calls. Full description here. The Greenwich Audubon Center is a nature center and wildlife sanctuary owned and operated by the National Audubon Society. With more than 15 miles of scenic hiking trails, and 650 acres of mixed forest, meadows, wetlands, ponds, and streams, The Greenwich Audubon Center strives to meet its mission to conserve and restore natural ecosystems, focusing on birds, other wildlife, and their habitats, through education, conservation and environmental research to encourage the responsible usage and stewardship of natural lands. The Center seeks a Center Assistant to provide high-quality administrative support. Specifically, s/he will be responsible for providing excellent customer service, executing rental contracts, staffing the Nature Store and facility rentals as needed, and ensuring the smooth operation of the Audubon Greenwich Nature Store. The position will have a 20 hour/week schedule, Tuesdays through Saturdays. Essential functions include: act as the face of Audubon Greenwich, greeting visitors, answering questions and triaging requests as needed; be responsible for staffing the Nature Store and coordinating Nature Store volunteers to assist with customer needed; serve as the Center point of contact for facility rentals; work closely with senior Center staff and catering contractor for Barn rentals to ensure that contracts are created and delivered on a timely basis; respond to all event booking inquiries and other public communication within one business day; sort incoming and prepare outgoing mail; assist with electronic submission of proposals, reports and correspondence as needed; inventory, order office and nature store supplies as needed; inventory and order store merchandise as necessary in accordance with the seasonal store purchase order calendar; and other duties as requested. Qualifications and Experience: High School Diploma or GED equivalent and 1-2 years' demonstrated office administration experience; exceptional organizational ability, attention to detail and a can-do attitude are essential; bookkeeping and contract preparation experience a plus. ; proven ability to track and move tasks/projects to completion in a fast-paced environment; the ability to work independently with limited supervision, as well as part of a small team. Bilingual in English and Spanish strongly desired. Complete job description and application instructions here. The Regional Center for the Arts (RCA) is a part-time interdistrict magnet high school committed to bring together people of diverse cultural heritage to develop in all students the knowledge, skills, attitudes and self-discipline to reach their fullest artistic potential, to live a productive life and to contribute to society as creative engaged citizens. RCA is looking for an instructor to teach the fundamentals of musical theater performance to passionate high school students. The successful candidate should have experience as a performer, an understanding of the vocal, dance and acting demands of musical theater performance, and a demonstrated ability to teach young people. The teacher will teach classes in the fundamentals of musical theater performance, and guide the students in applying their skills in a scene study class. The scene study class presents public performances once a semester. The candidate must also be able to collaborate with others while preparing students for performances. He or she must meet the requirements to successfully obtain an adjunct arts instructor permit from the CT Department of Education. Apply here. The School of Rock Music Instructor teaches students from ACDC to Zappa. The Instructor creates a safe and cool environment for students to achieve their musical and creative potential and ensures that each School of Rock student has an exceptional musical journey. The Instructor is responsible for all music and education-related elements within the lessons. The Instructor creates a dynamic lesson experience to insure their students are challenged and inspired. The Instructor embodies rock and roll in a positive way and is responsible for creating the most valuable student lesson experience possible. The School of Rock teaches five core areas: keys, vocals, guitar, bass and drums. Many instructors have broader musical talent as well which we do our best to engage. Music Instruction: maximize the quality of music instruction including private lessons and shows; ensure sure the students are learning the fundamentals of music, not just songs; create and document thoughtful lesson plans. Customer Connection: communicate regularly with parents on progress of students after lessons; interact with parents and students regularly by being visible and accessible in the school; pitch in during canceled lessons in the overall execution of the program. Apply here. Westport Country Playhouse: P/T Box Office and Concessions Associate. July c1: Zea Mays Printmaking Mentorship: Application Deadline. FOLLOW US! Follow the Cultural Alliance on Twitter, Facebook, YouTube + Instagram. Then, share this newsletter with your friends. Thanks!